*Nico and Marije (FHANA - Star Mare) produced another incredible black and white 3/4 Friesian colt! This is a phenomenal rare 3/4 Friesian with a world-class pedigree and incomparable quality. Marije is a star mare sired by Anton. 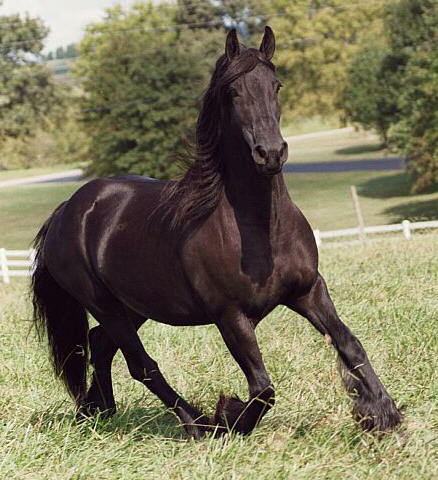 She is the most stunning Friesian mare I have ever seen, and her movement is breath-taking. Nehemiah is a full brother to Adonai ........just as big and handsome, and what a canter! 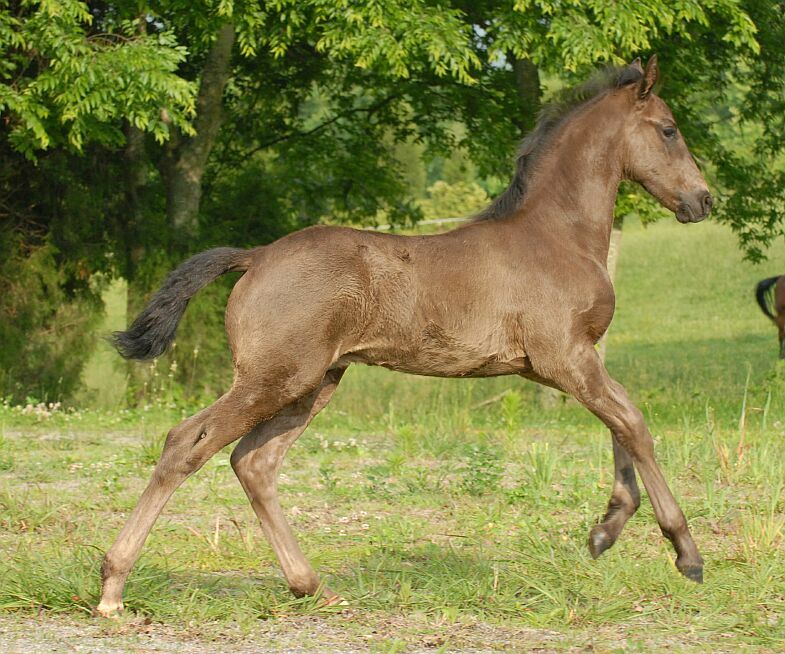 This colt was sold to Cynthia of New York who has exciting competitive dressage plans for him! We are expecting 2 more of this combination in 2007! continues to produce size and quality. This is a winning combination! Joseph was purchased by the lovely and accomplished dressage rider that bought our 2003 filly Truth. Joseph is Kristin's next young project! to 1999 Gold Metal Dressage Young Rider Kristin Knudson who also bought Truth! Enjoy your new boy Kristin! Wow! Super fancy.....very huge attitude! Kind and loving yet very proud! Simeon is a full sibling to No Tellin' and Butterscotch. This cross has proven to be very fun and fancy with their movement......and super sweet along with very correct conformation. Perfect for a youth or amateur rider who wants personality and gentleness with performance potential. Oh oh....another breeder decided to keep her *Nico baby! Kaye decided she could not part with him...we left him up here to appreciate what *Nico can with produce with a quarter horse mare. This is funny....the dam is my personal trail riding horse and is a very amazing athlete. She is a palomino and is a registered Appendix QH. I bred her hoping to produce a palomino and white trail horse for myself.......only (oops!) the baby was a bay! Sometimes 'oops' babies are the biggest blessing of all (as some of you ladies may know)! He turned out just perfectly put together as you can see by the photos. 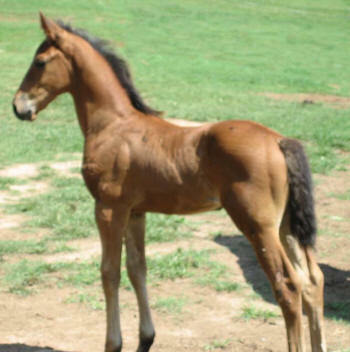 This is a super fun , friendly and very athletic young colt. He will be sold as a gelding and will make someone a life-long companion....he will be versatile and just plain wonderful! ....to Kristin Little who was so excited to find a boy that would be a safe and wonderfully minded mount! Have fun Kristen! Jacob is an exceptional colt out of a proven combination!!! Nico and Fimke D (an imported Remmelt daughter) produce big fancy dressage movement, incredible disposition, and beautiful feathers...loads of presence. Mature height will be 16-16.1 hh. His full brothers are Luke, Levi, and Isaac...all so willing, honest, and gentle. 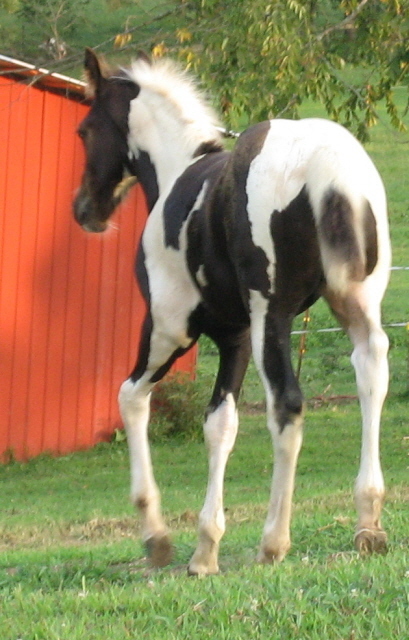 Beautiful shoulder, neck, and hind end. Bold, forward, powerful movement with lots of performance potential and the disposition to trail ride!!!! All around super colt! !